Ce chalet récemment rénové offre tout le confort de la maison. Une chambre avec un canapé-lit dans le salon. Spacieuse salle de bain 3 pièces. Vous pourrez facilement préparer vos repas dans la cuisine entièrement équipée ou sur le barbecue à l'ombre d'un orme dans la cour avant. Profitez de la plage privée en faisant une promenade très courte à travers la propriété du propriétaire de la maison au lac. Pour votre divertissement une télévision à écran plat (satellite), wifi, jeux de société et des livres sont fournis. Cet emplacement est à distance de marche de toutes les commodités du village et à seulement une heure de route à de nombreuses autres communautés populaires sur l'île. Baddeck est le début et la fin de la Cabot Trail tristement célèbre avec son à couper le souffle paysages, les sentiers et les plages de sable fin de la randonnée. Spacieuse salle de bain 3 pièces. À distance de marche de toutes les commodités dans le village de Baddeck. The gatehouse was a perfect place to stay for a couple. It is small but comfortable and very well equipped. It may seem like a small thing but one thing we really appreciated was having enough lighting, for example for reading in bed or in a living room chair. It's very close to the main part of town - initially we were not sure about walking along the road to town, but there is a wide shoulder and a lot of people seem to walk back and forth from nearby hotels and other properties. 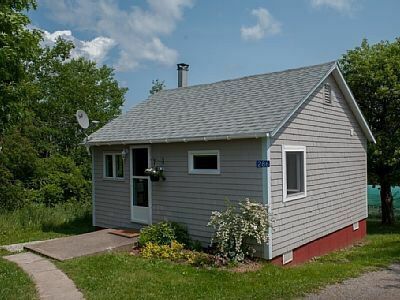 We enjoyed staying here while exploring the area and appreciated the ability to easily walk into Baddeck. Much more room than a motel and we fixed our breakfast before heading out. We would stay again. Clean, comfortable, close to the village center. Hosts live nearby. Easy to find. Perfect for two people who don't want or need the 5 star resort experience. First of all it was very easy to get to and find. Kerianne made the instructions very easy. Our stay was enjoyable. Very quiet and clean. Plenty of hot water for showers. If had another chance to go back to Baddeck would go back again and recommend this little getaway. Thank you again. This was a perfect small cottage for 2 adults and 2 dogs. Close enough to walk to town although we biked everywhere. We had lovely time with all the Baddeck has to offer. The cottage was very close to the lake for swimming and just sitting. Altho it is small it is well designed and the owners were very helpful and friendly.We stayed for 2 months, part of June,July through mid August. I rented it for my friend and her mother and her daughter. They told me they had a great time. The cottage was cosy and clean. Thank you so much!! Check in 3:00 p.m Check out 11:00 a.m. I do accept Visa, MasterCard and American Express.